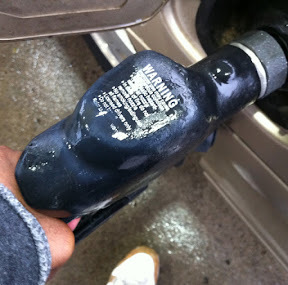 There's one thing I've learned about writing about gas prices all these years. Gas prices have always followed trends. In the summer you expect to pay more as demand went up. Demand goes down in the Winter. But for years, the trends from year to year remained steady and not peaking over $1.50 until after the dawn of the new millennium. Day in and day out, as we face this current gas crisis I'm always looking for new angles. Let's be honest, we've exhausted just about every angle there. But, this is interesting to me. The Department of Energy has been keeping tabs on gas prices since 1983. Yes, I am older than this survey. Go ahead, let the old man jokes begin. Fault me for having a short term memory, but one dollar gas prices seem like a far and away dream. I feel like I've been paying $2 and $3 for gas forever now. But, really when you look at this chart we have had it good for years. Some how even with summer and winter driving and pricing trends, gas prices seemed to remain below $1.50 for the better part of 20 years. So, what is going on now. What happened in the last 10 years in some of these oil producing countries, in the United States or within the oil industry that wasn't happening back then? When I graduated high school in 1998, I wasn't really buying my own gas because I didn't have a car.. but my parents at the time were paying according to this chart between $0.65 for a gallon of regular gas.. and $0.77. Flash back even further to 1987 Still gas prices were only between $0.64 for a gallon and $0.72. So, from the time that I was 7 to 18 there was very little change in gas. But after I turned 21 it went all up hill for gas prices and the Gas companies which are now making record profits. In 2002.. when I graduated College, this chart shows gas prices between $0.67 and $1.32. I remember freaking out.. when gas prices topped one dollar a gallon. I was in Tallahassee.. driving across the border to Thomasville Georgia to get cheaper gas- by about ten cents.